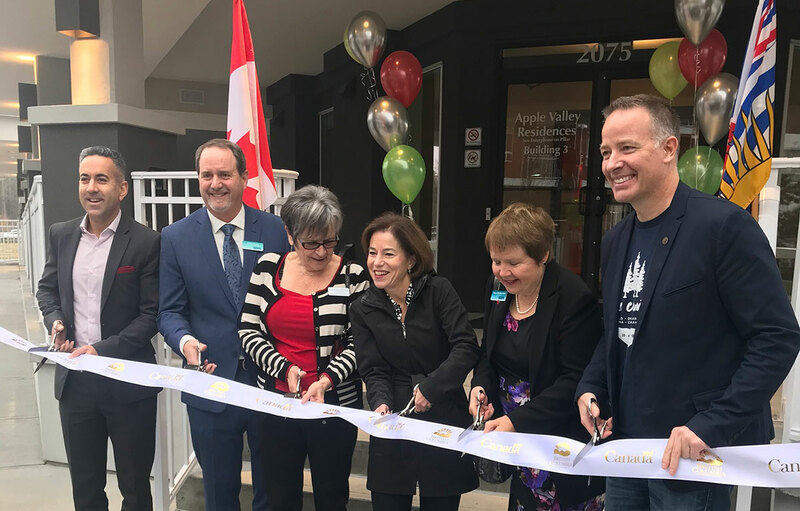 The Society of Hope's 22-year vision of bringing affordable senior's housing to Kelowna has been realized. To much fanfare, the ribbon was cut on the third phase of Apple Valley, a senior's complex on Benvoulin Court, Thursday morning. The 47-unit building brings to 199 the number of affordable senior's units in the development. Society executive director Luke Stack says the vision began with the donation of land in the Landmark Centre area in the late 1990s. The society sold that land, and used the proceeds to purchase what was at the time the Pettit family farm, where Apple Valley now sits. "It took many, many years to find this site, get it out of the ALR, rezone it, get the roads built. That added quite a few years to the project," said Stack. "But, it turned out to be a great decision because it's so well located now. It's perfect." Stack says the society is still trying to determine what to do with an additional two acres at the back of the complex. It's also constructing 21 family townhomes in Glenmore. In all, Stack says the vision is to build another 150 units of affordable housing in Kelowna over the next five years. Geraldine Barsetti is one of the residents who moved into Apple Valley 3 in October. She said she feels at home, and very safe, and has had no trouble meeting people and making friends. Total cost of the entire development came in at $38 million, with $15 million of that coming from all three levels of government.